He's sitting in the Southern Regional Jail, in Beaver, West Virginia, on charges of trespassing and obstruction, a $5,000 cash bond riding above his head, a contempt of court charge, in defiance of a temporary restraining order staring him in the face. Sounds like all is going as planned for 55-year-old Kentucky-native Mike Roselle, the legendary environmental activist. Occupying the offices of Marfork Coal Company on February 18th, Roselle and two other activists delivered a warrant for the citizen's arrest of the Massey subsidiary president in violation of the West Virginia State Code §61-3E-10 for "wanton endangerment involving destructive devices, explosive materials or incendiary devices." Roselle and his group's mission: To stop the reckless blasting on the Coal River Mountain range, within a football throw of one of the nation's largest and most precarious coal slurry impoundments. Are we simply going to sit back in our offices and homes in acts of good behavior and allow the Obama administration to stammer in indecision, clearly without a roadmap to end mountaintop removal, as millions of pounds of ANFO explosives are detonated daily in Appalachia, including Coal River Mountain, while the largest forced removal of besieged American citizens takes place under violation-ridden acts of assault, thousands of acres of hardwood forests are wiped out, and American watersheds and waterways are jammed with toxic coal mining waste? Regardless of what anyone thinks of Mike Roselle's nonviolent tactics -- and his lifetime of controversial agitation -- he has emerged as a clear-eyed abolitionist in an era of regulatory double-speak. Sitting in that Southern jail cell like a bon vivant soothsayer, Mike Roselle is a living testament to one undeniable truth: Mountaintop removal mining, the most egregious human rights and environmental violation tolerated in our nation, must be abolished, not regulated. Truth is, while the rest of us from San Francisco to Phoenix to Chicago to Orlando to Washington DC enjoy the warmth around the hearth of our coal-fired electricity -- courtesy of coal generated from mountaintop removal operations or smaller strip mining operations, or devastating longwall operations--Mike Roselle has chosen to put his life on the line and force our legal system, and the nation, to determine who is the real outlaw--nonviolent coalfield residents defending their land and lives, or Massey Energy, proud holders of a criminal and civil rap sheet that make Roselle look like a Boy Scout. Last spring, in a very provocative essay, he turned the mirror on his fellow activists and asked: "Why is the environmental movement so timid? From Birmingham to Coal River." "Here on the Coal River, we are trying to infuse a deeper meaning to our non-violence. These actions are not media stunts but a last ditch effort to save the Appalachian Mountains from total destruction and time is swiftly running out. If the Massey TRO is successful in crushing our budding rebellion in West Virginia, then I fear our movement is not going to be successful in saving what's left of the Appalachian Mountains. 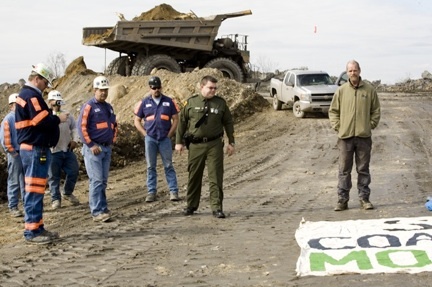 However, if we can end Mountaintop Removal by standing up to Massey and the coal corrupted West Virginia courts, then we will have learned a valuable lesson about nonviolence and how to confront the crisis of climate change. In the end, it will not be the clean energy future that we must build, as the CCA e-mails continue to urge me to do, but the urgent, dangerous and dirty energy present that we must confront, and confront it in here in the strip mines of West Virginia, where the rule of law has been denied to both the people and the land for too long. Only the harsh light of non-violent confrontation will illuminate the dark hollows of Appalachia, and bring in justice, our one and only request." Says Vernon Haltom, a resident in the Coal River Valley: "Mike Roselle is a catalyst who inspires bold action, and bold action is what's needed in the struggle to protect our homes and communities from corporate criminals such as Massey Energy. The appeasement and half measures taken by state and federal regulators do nothing to deter chronic lawbreakers like Massey, so citizens must fulfill the role that regulators refuse. the line to prevent environmental destruction and his work to end the devastating practice of mountaintop removal has had significant effects." Meanwhile, Mike Roselle sits in the Southern Regional jail cell. Mamas, don't let your babies grow up to be Mike Roselle--we just might end mountaintop removal if that ever happened. And the illegal and dangerous blasting on Coal River Mountain, courtesy of Massey Energy continues. To support Roselle or contribute to his legal defense fund, go to Climate Ground Zero.